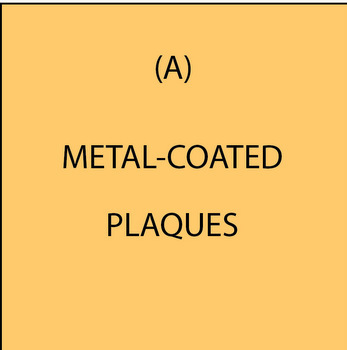 Signs and plaques in this section are made with metal coatings of various types (bronze, brass, copper, nickel-silver, stainless steel, and aluminum) which form a hard, durable veneer on a substrate manufactured from High-Density-Urethane (HDU), plastic, or metal. Our bronze and brass plaques are most popular, and are alternatives to fully painted or stained wood plaques and signs. These wall plaques can have either raised and sculptured 3D carved bas-relief art (similar to Product Line 2) , beveled or V-cut engraved text , or raised 2.5D raised art and text, sometimes called flat relief (similar to Product Line 1) . All our plaques and signs have a hard metalized epoxy resin veneer applied to the surface to provide a high degree of ruggedness and protection against damage, and to extend lifetime. These metal-coated signs and plaques are suitable for both outside and inside use for memorials, monuments, government and public buildings, museums, historical buildings, informational displays, and seals or logos on the walls of government and commercial buildings . Smaller versions are suitable for omside walls in lobbies, offices, conference rooms, and podiums.These metallized plaques are roughly 1/3 to 1/4 the cost of cast bronze plaques. look very similar, and last decades. We coat our very high-density-urethane (HDU) and metal plaques and signs with a metal coating liquid spray (using a spray gun or airbrush) . We use their proprietary blend of composite metals and a binder (similar to epoxy resin for fiberglass) that we cold-spray onto the HDU substrate to create the look and feel of solid cast metal. The metal coating has a living finish and will age naturally over time. The metal is applied as part of a proprietary seven-step process by our craftsmen. At an average 10-mil thickness (metal electroplating is less than 1-mil thick), our metal-coating process adds less than four ounces of weight per square foot, provides the durability of solid cast metal, and is non-corrosive. Our metalcoating and HDU substrate has a Class 1-Class A fire rating. Our proprietary metal-coated HDU substrate may be used for interior and exterior applications. The metal coating will not chip, flake, bubble, or peel and will last a lifetime. Our metal coatings include copper, bronze, brass, nickel-silver, stainless steel, aluminum, and iron. All of these coatings can be applied with a patina, spot-polished, or high-polished. Samples of these colors and textures are shown in the photos M7002(bronze), M7101 (brass), M7202(copper). and M751 (nickel-silver , stainless steel and aluminum). The variations for each material are achieved by the mixture ratios of the coating material and the amount of polishing on different areas . Please click on " Return to List" to see over 100 photos of our bronze, brass, copper, nickel-silver, stainless steel and aluminum plaques and signs. Please call us at 951-698-8484 or email us at info@artsignworks.com for more information on design options, price quotes, and delivery schedule, and our knowledgeable and helpful Customer Service Representatives will respond to your requests promptly. We are proud of every sign we design and fabricate, and we are sure you will be pleased with your carved sign or plaque.